BCPSLS Central Office and Lower Mainland Medical Imaging (LMMI) are excited to announce the launch of a new specialized provincial form to support better reporting and learning from patient safety events involving medical imaging procedures! With millions of medical imaging exams performed each year across the province, the new form unlocks the potential to identify both system-wide issues and broad-reaching improvements to patient safety. A cornerstone of diagnostics, medical imaging is paramount in confirming, assessing, and documenting the courses of many diseases and injuries as well as responses to treatment. Most exams go smoothly, but occasionally things don’t go as planned. Problems with medical imaging can have an enormous impact on our health care system, as effective decisions depend on accurate and timely diagnoses. The idea for the project began in 2014 when Trudy Pel, Regional Quality Coordinator, LMMI, and Terri Aitken, Coordinator, Safety Learning System, Vancouver Coastal Health, were reviewing safety event data to assist LMMI in establishing Key Performance Indicators. LMMI is a consolidated service providing diagnostic and therapeutic imaging across Vancouver Coastal Health, Providence Health Care, Fraser Health, and Provincial Health Services Authority. With a dedicated staff of 1,500 people across 29 hospital sites, LMMI performs more than 2 million exams annually involving X-ray, CT, ultrasound, MRI, mammography, nuclear medicine, and bone densitometry, plus interventional radiology such as angioplasty. 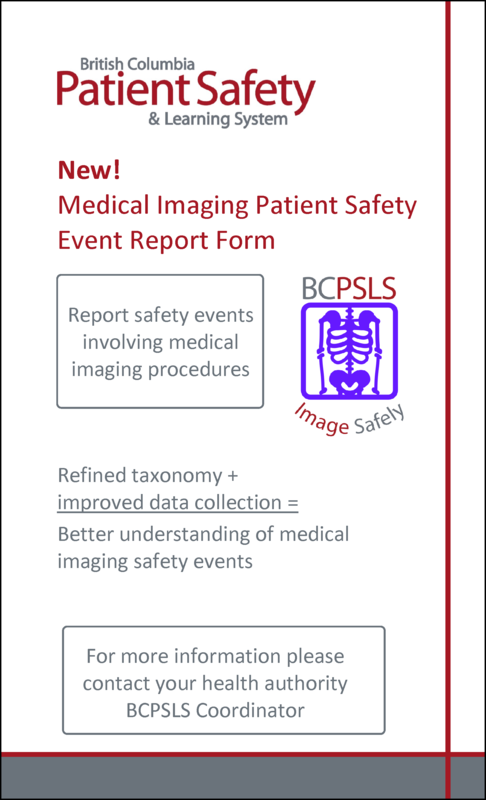 In response, the team at BCPSLS began exploring best practices for reporting medical imaging safety events and came upon the Radiology Events Register (RaER) used in Australia and New Zealand. RaER was the first national or international medical imaging-specific incident reporting system to be established. It was founded in 2006 by the Royal Australian and New Zealand College of Radiologists to provide a platform to improve safety in medical imaging by recording, classifying, and analyzing safety incidents in a way that was relevant to medical imaging and could result in improved patient care. BCPSLS and LMMI worked together to develop a new form, fields, and taxonomy that were largely based on RaER, which was adapted with permission for use in the BC health care system. Using a Plan-Do-Study-Act iterative approach, LMMI staff tested the draft forms and identified areas where they could be improved. Representatives from Island Health, Northern Health, and Interior Health were also invited to provide feedback to ensure the improvements would meet the needs of the medical imaging community across the province. A new form that enables greater specificity when reporting safety events involving medical imaging procedures, such as modality (e.g. X-ray, CT, MRI) and the process step of the event (e.g. before, during, or after the procedure). A refined taxonomy supports collection of better data quality, which will help BCPSLS users in all Health Authorities more clearly understand medical imaging safety issues and facilitate shared learning and improvement across the province. The development process was driven by many dedicated professionals who lent their time and expertise to ensure the new form would address concerns and meet the needs of BC’s medical imaging community. Elizabeth Jongedijk and Kevin Enns, Regional Managers, Quality & Process Improvement, helped facilitate the process and offered their support. Elizabeth encourages BCPSLS users to continue to help make improvements to the new medical imaging form by using the feedback portion of the form, particularly users who may not have had as much involvement in the development of the form. Positive feedback is welcome, too! The roll-out of the new form includes a promotional campaign with posters in medical imaging areas throughout the province. Watch for medical imaging staff wearing buttons with the new icon and “Image Safely” slogan to identify themselves as champions of the new form, available to answer questions and respond to concerns. Thanks to Trudy, Terri, Elizabeth, Kevin, and the BC medical imaging community for their input and support to improve the medical imaging safety event report form for use across the province! Mandel, Catherine. “The Radiology Events Register (RaER).” HealthManagement, Volume 15 – Issue 2, 2015. https://healthmanagement.org/c/healthmanagement/issuearticle/the-radiology-events-register-raer.